Daisuke is blonde with short spiky hair. He has jet blue eyes. He stands around 6 feet tall. 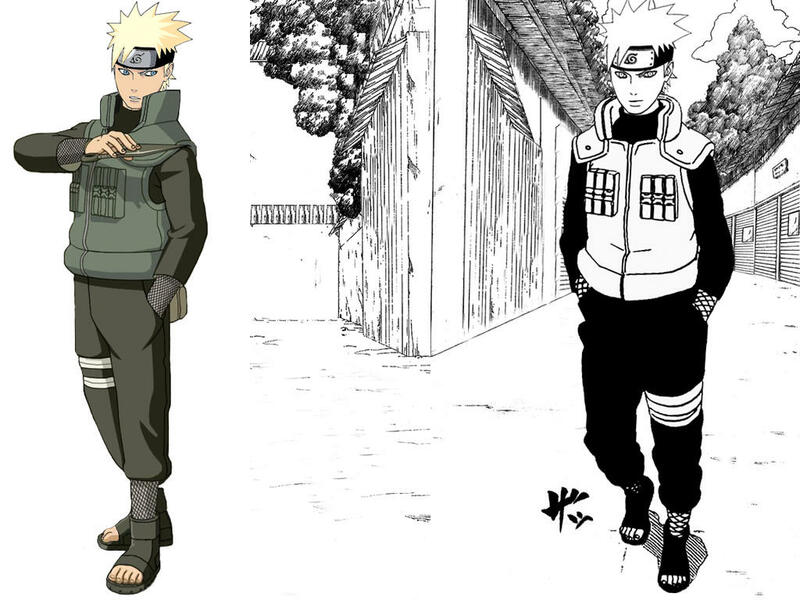 Even though he is a genin, he wears the Konoha flak jacket and standard attire. Personality: Daisuke is known to take things way too seriously. He is an intense guy who is rarely found joking or having a good time. Daisuke is the first person to be told to lighten up, words that he could use with listening to. That being said, he is ambitious and driven. His goals are too become a Jounin and a well-respected member of the Yamanaka Clan. He is smart and meticulous. History: Daisuke grew up to Konoha and Yamanaka clan customs. His parents are both well-respected members of the Yamanaka clan, as are his three older siblings. Being the youngest, he was often picked on by his siblings, but babied by his parents. His short-comings while he was an academy student have lead him to have a chip on his shoulder. He was nothing more than mediocre at the academy, often finishing middle of the pack. When he graduated and became a Genin, he promised himself he would always finish ahead of his peers as a ninja of Konoha. Description: This technique is used by Daisuke to establish a Mind Connection with the target. This jutsu is simply used to speak telepathically to a target. An excellent technique for teams that don't want to risk talking aloud during surveillance missions. Also a good way of setting off Genjutsu traps on Daisuke's opponents by setting off key phrases in his opponents mind. Description: This technique is generally used on immobile opponents, but doesn't have a defined range. This technique allows Daisuke to take control over a targets mind, forcing his will upon them. It takes a lot of chakra and energy to actually make the target move or act upon Daisuke's commands, but if anything will render them useless for a short period of time. During this time however Daisuke won't be able to move either. Description: Sea of Bodies is a genjutsu technique that attacks the visual sense of an opponent. Thousands of replicas of Daisuke will surround the opponent, all walking, talking, and acting like Daisuke. However none of them can cause physical damage like Daisuke. This technique is great for concealment and catching your opponent off guard. Description: This technique is used to confuse a target into thinking that Daisuke is their ally and their ally is Daisuke. This jutsu usually coincides with Mind Connection, then allowing Daisuke to plant key words into the target's mind that set the jutsu off. The target will then see their ally as Daisuke, and anything the real Daisuke says, he will hear from his ally instead, leaving little room to be dissuaded from thinking their ally really is Daisuke. Daisuke's early days as a Genin were plagued by not having friends nor having a team. That changed as he was selected to join Team One, a team lead by Tomoe Uchiha, the Hokage. She selected Daisuke alongside his good friend Arakui Uchiha. Daisuke had met Arakui at the academy and through training and getting themselves out of some sticky situations the two became close. The third member of the team would be Krysto Kaguya, a confident Genin that Daisuke had fatefully met the day before the team meeting. The team got along great from the start. They were soon a force to be reckoned with. They finished multiple missions. Some involving escorts, other breaking up weapon smuggling. For the first time Daisuke felt as if he belonged. Rumors of a Kusa tournament for Genin spread like wildfire. Daisuke was told that he would be going as well as five other shinobi from Konoha. Arakui and Krysto being two of them. He set out to meet the other three and talk to them about the tournament. The name 'Konoha Six' had been said somewhere. The name stuck, and Daisuke got to meet the other three members. The three were part of team two, Shiko Nara, Hiroshi Aokin, and Sakyo Uzumaki. The six all became quite close with another. They took pride being called the 'Konoha Six'. The tournament in Kusa was a shock to Daisuke. The Kusa Genin were very hostile. Rumors spread of them fighting to the death just ot graduate form the academy. To make matters worse, there were talks of a coup in Kusa. Daisuke met a young Jounin named Ayaka who was very protective of the shinobi from other villages. She would later become the leader of Kusa. Daisuke's tournament went well at first. He beat an Iwa shinobi name Jiro using his Mind Control Technique. The next round he fought a Kunoichi from Kusa and was able to defeat her. His third round was against a Sand Shinobi Mianyi Kamiya. He lost to her in a close and violent match. He was under the impression at one point that he was going to die from a poison consumption. Arakui Uchiha [Konoha] - Friend - Daisuke's closest friend and teammate of Team One. Part of 'Konoha Six'. Shiko Nara [Konoha] - Friend - Fought along Daisuke in the Kusa War. Part of 'Konoha Six'. Krysto Kaguya [Konoha] - Friend - Teammate on Team One. Part of 'Konoha Six'. Sakyo Uzumaki [Konoha] - Friend - Part of 'Konoha Six'. Hiroshi Aokin [Konoha] - Friend - Part of 'Konoha Six'. Kauzu Sarutobi [Kumo] - Ally - Fought alongside Daisuke in the Kusa War. Kotetsu Uchiha [Konoha] - Ally - Fellow Konoha Genin. Mianyi Kamiya [Suna] - Neutral - Fought against Daisuke in Kusa Tournament but was also an ally during the war. Tomoe Uchiha [Konoha] - Friend - Daisuke's sensei of Team One. Also the Hokage.